“Entrepreneurial mindset” is a buzzword. It is a collection of behaviors, skills, and competencies, knowledge and understanding and, of course, beliefs that, for many, intrinsically resonate as key to innovation and creation — and key to the future workforce. The value in the phrase is the recognition that students need to develop new skills and competencies for this changing world, a world where, as workers, they will be making jobs, taking jobs that have not yet been imagined and joining a growing force of temporary workers. Those sounding the early alarm estimate that by 2030, 83 percent of the jobs that will exist have not yet been invented. Across the world and our nation, work has already begun to transition. Independent work has increased by 7.9 percent in less than 10 years, with projections that by 2020, 43 percent of workers will be temporary contractual workers, changing the way individuals will navigate employment. The Kauffman Foundation is no stranger to the urgency the rapidly changing future presents. Through research and community engagement — including a vast regional survey, a large, community-engaged design thinking session, and an ideation team representing educators, parents, industry leaders, and civic change-makers — it’s clear that parents, educators, and employers all desire students to be better prepared for the ever-evolving future of work. The reality, however, is that present-day high schools, in general, are focused more on preparing students for traditional college than on the realities of life and learning after graduation. A report produced by the Mid-America Regional Council showed that industry continues to signal that hiring pools, including high school and college graduates, lack the ability to exhibit core competencies in a productive way. These core competencies, identified by industry as the “price of admission” for future employment, include the ability to drive results, collaborate, instill trust, plan and align, read for information, and use basic applied mathematics — not to mention financial literacy, which parents and students have signaled is a major deficiency in the high school experience. All these skills and abilities should be achievable from any K-12 system, given the right tools, experiences, and support. Innovating from the middle of America, district leaders across the Kansas City metro region are responding by activating a new paradigm within their high schools. High schools in the Independence School District link students to businesses and problem-solving opportunities in their communities, providing real-world learning that results in industry-recognized credentials and/or dual college credit. Eight school districts on the north side of Kansas City established Northland CAPS, a program where 100 percent of students leave high school with a robust internship experience, sponsored by local industry partners, in a high-demand career. 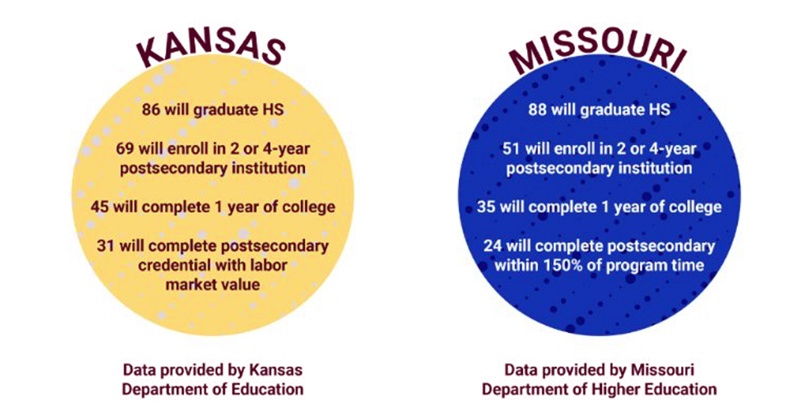 Diploma+ in the Kansas City, Kansas, Public Schools empowers students to exit high school with more than just a diploma, so they can successfully transfer their knowledge to the next step in their career and/or education. All these programs are built on one important premise: that learning needs to be purposeful and relevant, allowing students to explore real problems and gain the skills necessary to solve those problems. Yet in the Kansas City metro area, only about 10 to 15 percent of high school students experience real-world learning that aims to foster the kinds of skills, behaviors, and competencies that enable them to be entrepreneurial and prepared for future work. The entrepreneurial mindset is not reserved only for future business leaders or for the privileged few, and while all students need postsecondary education, traditional college is not the sole track to success. Currently, in Missouri, only a quarter of high school graduates leave with a college degree after six years — and Kansas data suggest that its students don’t fare much better. In this upcoming year, the Kauffman Foundation will focus even more on how to grow, at scale, an infrastructure to ensure that all students across the region have access to real-world learning. As our economy changes, uncertainty becomes a catalyst for opportunity in education. While we work to help expand and scale education’s evolution, we must ensure that students who have been historically underserved are not further left behind as the focus of school shifts from traditional top-down instruction into problem-solving centers. Ewing Marion Kauffman understood that entrepreneurship and education could have the most significant impact on solving societal problems. In that vein, “entrepreneurial mindset” is the belief in one’s capacity to solve problems and the ability to mobilize resources to address that challenge. We must foster a new culture in our education systems. Our K-12 schools will play an essential role in ensuring that students gain far more than a traditional high school diploma. They must have more transparent choices to select the right duration and type of postsecondary experience, driven by individual passion and interest, in order to enter the workforce prepared. This requires a robust educational experience in which all students are ready to solve problems and navigate our changing workplace. Donna Deeds is educator-in-residence in education at the Ewing Marion Kauffman Foundation.